Fertigation and Water Savings are just around the corner! e at Soil Technology are excited to bring our water saving technology of fertigation and solutions in conservation to the communities of Shore Point in Temecula, CA, and Shady Grove in Fallbrook, CA. Our trials with Shore Point began June of 2017, with the approval of a 4 month trial to ensure that the system would improve the visual beauty of the landscape. October rolled around and not only was the landscape visibly improved, but the proposal for and install of 25 fertigation systems was accepted by the Board of Directors! ​Shady Grove, right here in our hometown of Fallbrook, extended interest in our water conservation methods through fertigation and requested an evaluation of their entire HOA. The proposal included the use of our patented liquefied polymer and has since been accepted. Installations will begin this month. It will be a beautiful spring for these communities and we are excited to see where else 2018 will take us to help others conserve, sustain and thrive. ​Soil Technology recently concluded AquaBoost polymer trials for two of the largest growers in the world! Not only did we see savings in water, but crop yields and extended plant shelf life were also a part of the trial success. The first application was with a large almond producer located in Lost Hills, CA. Formerly Paramount Farms, they conducted a series of trials using our AquaBoost product, and ended up seeing results of 25% less water and an increase of 428 pounds per acre! longer before wilting than the untreated plants. So this spring when you go to your local Big Box store to pick up some color or plants for around the house, chances are that they have been given an extended shelf life thanks to AquaBoost! Whether it is helping save water within HOA's, groves, farms, or extending shelf life for plants, AquaBoost and Soil Technology are creating more green and water-wise clients within California. See what else we have been up to by following our FACEBOOK or our LINKED IN profile! We're Headed to The Beach! Cabo San Lucas; a premier resort destination. Boasting a wide array of activities such as: golfing, diving, fishing, sailing and touring, it is a paradise of life and excitement. 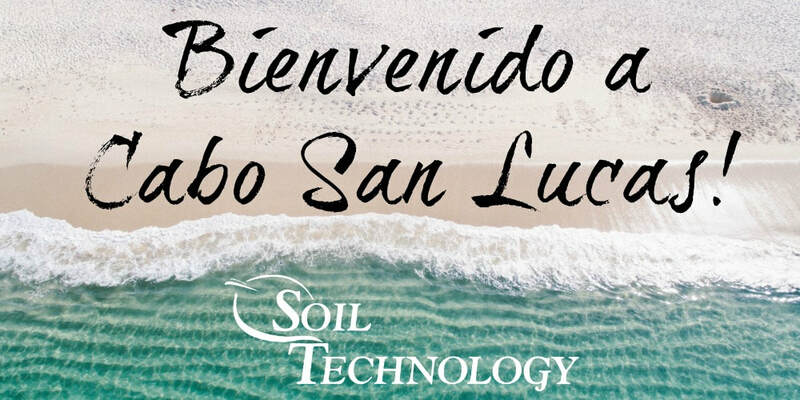 It is also now the new venture of Soil Technology! We have begun the process of exposing our AquaBoost product to the resort and golf community and have received outstanding results in water conservation. "...I am confident we can save 20-25% on our irrigation costs using AquaBoost and therefore I am a believer in the product." Resorts, Golf Clubs and water savings all go hand in hand for the Cabo San Lucas community and we are excited to be a part of something new down in Baja Mexico! Will recent rains mean an increase in our water supply and drop in water prices?Mark Weston, a Poway resident and immediate past president of the county agency board, told the council that the San Diego County Water Authority (SDCWA), had invested extensively over the past two decades to upgrade water storage and delivery systems so the county can wean itself from "Metro" water. Part of the higher water costs being passed along to local water districts reflect the costs of financing those improvements. Rates are likely to climb consistently in coming years, he agreed. "It doesn't take a rocket scientist to know it's going to get more expensive," Mullin said. Water prices in Poway are continuing to rise after a city council meeting, where the vote was unanimous to raise rates, even after the complaints of many residents was heard. "I've lived here for 25 years, and my water bills keep going up, up, up, " one woman said. "I don't use my dishwasher, I've got dirt for a lawn, and this is how we get rewarded?" ​While we have received a substantial amount of rain, water will not be more affordable than it was last year. As a matter of fact, it will cost you more. January marked a special time for Soil Technolgy and the Mellano Company, since it was the first testing of our patented polymer at the infamous Carlsbad Flower Fields. A savings of 20% has been maintained and we are now conducting the next and final validation trial at their 350 acre ranch, located in San Luis Rey. For this trial, separate irrigation lines have been installed to apply the polymer in four replicated areas onto one of the myrtle fields. A valuable aspect of this trial is the data comparison we will be able to achieve, since production records for this particular field goes back 15 years. So not only will we be gathering water savings data, but will also measure productivity rates as well. We are expecting great results from this trial, so stay tuned for more updates! Like what you see? Want to learn more? Schedule a lunch and learn or contact our team to see what Soil Technology could do for you!